Come and relax in style. Situated at the foothills of the Magaliesberg Mountain Range, overlooking the Hartbeespoortdam from east to west. 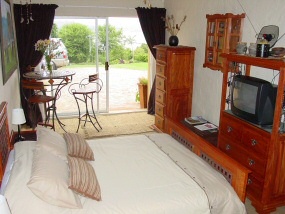 Luxurious accommodation furnished in solid rosewood furniture, local art and with en-suite bathroom. Big, beautiful and colourful garden to enjoy bird watching. 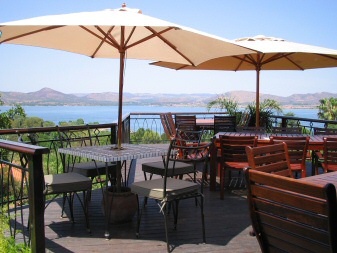 Large wooden deck overlooking the Hartbeespoortdam and Magaliesberg Mountains to enjoy a sun downer and breakfast. Breathtaking views, sunsets, sunrises and thunderstorms can be enjoyed. Enjoy the view of the Hartbeespoortdam while lying in your bed. Walking distance from the finest restaurants and art galleries in the area. Spoken languages: Afrikaans, English, German.